Posted on September 29, 2011, in School Assignments and tagged Chase McFadden, Chuck Norris, Chuck Norris facts, funny kids, funny writing, Humor, Ironic Mom, Kids, Leanne Shirtliffe, Some Species Eat Their Young, Stuff Kids Write, Stuffkidswrite.com, Tantrums and Tears. Bookmark the permalink. 2 Comments. Chuck Norris brought the Korean style of martial arts known as Tang Soo Do to the United States of America in the latter half of the twentieth century. He trained a man who went on to become a Grandmaster in Tang Soo Do who then trained a spunky kid named Jacob Flame (real last name. seriously) who opened a karate studio where (for over six years) my kids have been studying to get their black belts and I have been handing out money like water (although I suppose one doesn’t actually hand out water unless he/she is volunteering at a marathon or something). 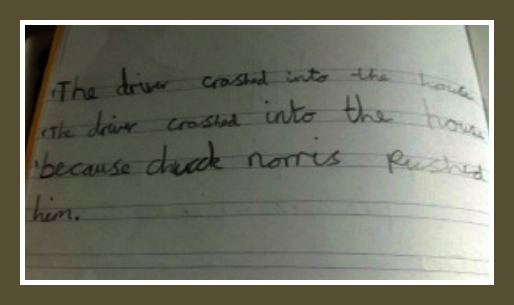 Anyway, because of Chuck Norris, my kids will probably not be able to afford college. But they may find jobs as car pushers.